Craft projects made with recyclable materials have been steadily gaining in popularity and it is no wonder why. The ability to upcycle an otherwise useless item is so satisfying, budget sensitive and green. Plus, the creative ways that these items have been used results in much more of a work of art than simply a thrown together mix of random trash items. I have found a collection of several recycled crafts that have gone above and beyond in creativity. These should inspire you to want to save your trash and begin your own upcycling. Who knows what kind of treasures you will come up with, with just a little imagination! Now! I am going to tell you something else but you cannot skip ahead to the end of the post. After all, all of these craft ideas are very inspiring. However, I do have a special surprise at the end……I am so excited to have found it that I had to do a little dance! 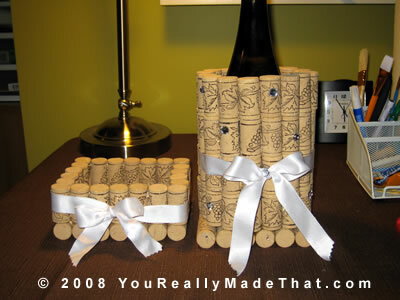 Wine cork crafts are quite popular but making a wine bottle and accessory holder is an especially fun idea. It makes the perfect bar decor! Check out how You Really Made That put this set together. As long as you are saving wine corks, you might as well save the wine bottles too. 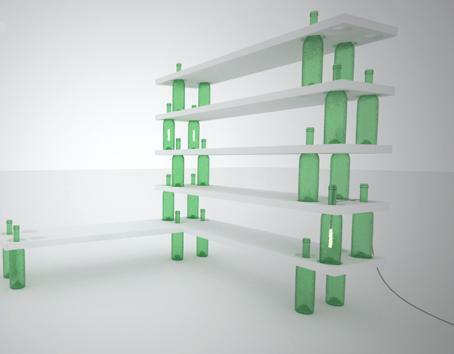 There are plenty of things to do with wine bottles but this diy shelf by Crib Fashion has to be one of the most creative uses. 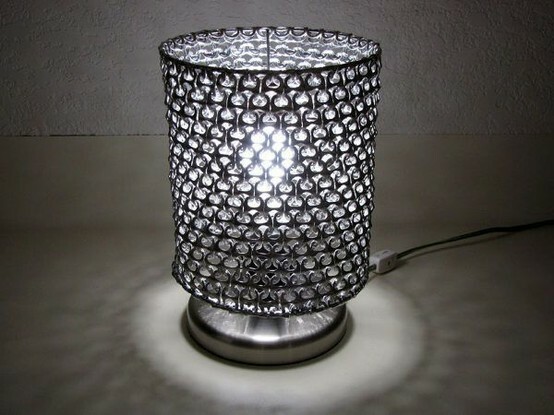 This lamp by Cacareco is made from tin seals from cans and looks super chic. Who would ever think it was made up of a common throw away item like tin seals? Now, if you are going to start saving tin can seals, you will want to also save the cans themselves. There are so many creative ways to decorate cans for storage or to use as vases like these wallpaper covered cans by Martha Stewart. This is probably the most fun use that I have seen for recycling bottle caps! 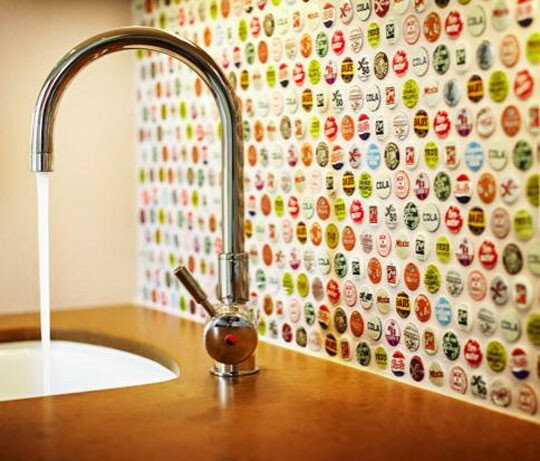 Apartment Therapy gets very creative with this fun backsplash which would be perfect to do in a home bar area. The bottle caps get applied the same way as tiles and make a decorative way to display your favorite types of beer or soda. 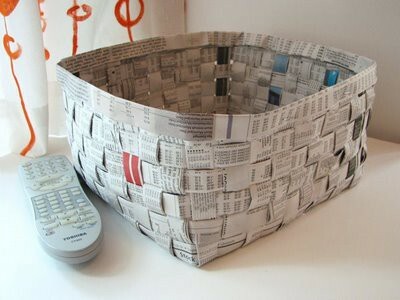 Newspaper is usually readily available and I am loving this basket craft idea by How About Orange. I may even use the basket to store……newspapers -haha! 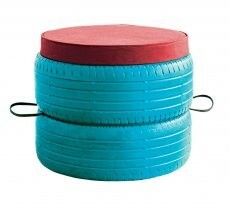 Here is something that I hadn’t considered before – repurposing old tires into useful and fun seating! Frangiaecochic refurbishes old tires into chairs, ottomans and tables. The bright paint really gives it a fun look. From bathroom trash to kitchen treasure, this refrigerator pen and pencil holder is super easy to make from an ordinary toilet paper roll. Sew And Dippity shows how to give it enough pizzazz to display front and center. 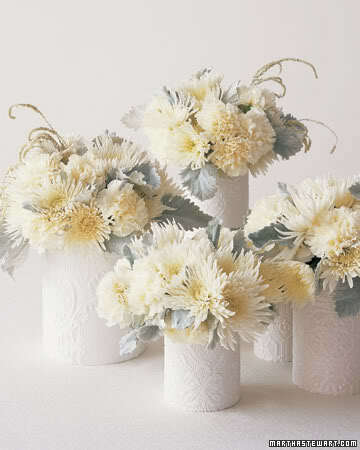 There are many other very creative toilet paper roll crafts here. Okay, so I told you that I had a surprise at the end and I am getting to that right now! Are you just holding your breath in anticipation? You are going to love this – I promise! If you are like me, you have lots of old cd’s just hanging around collecting dust. With the popularity of ipods, those little rascals just don’t get used as often anymore! Well now I have a super fun way for you to make use of some of them. This idea and the surprise comes from White Life. Yep!! Those wonderful looking clock faces are actually recycled compact discs! I am so in love with the look. 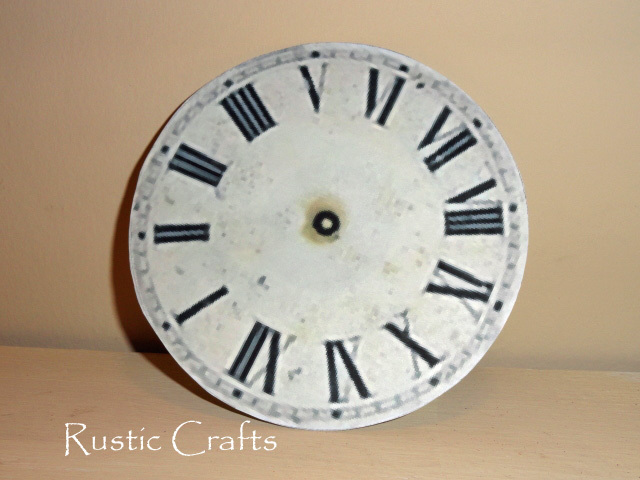 ******11/27/12 UPDATE – White Life has taken the clock face printables off of their site. However, I also found a free printable for a plain clock face at Print Free. First I printed off one of the images. You will want to make sure your printer page setting is not set on “fit to page”. I had it set that way first and the image printed off too big. I printed an 8×10 image to get just the middle clock face. 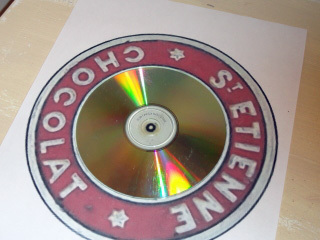 For the full image to fit the cd, you will want to print a 5×7 size image. At first it didn’t occur to me to change the print size from 8×10 to 5×7 and I just used the center part for the cd. I was a little disappointed on not being able to use the full image until I figured out that I could print it out as a 5×7 and get the entire image to fit on the cd – hello!! Sizing the two pieces up, I then applied spray adhesive to the compact disc and carefully laid the paper over it, rubbing it smooth. Walaa!! Since this was just quickly done as a sample, I only printed it on regular paper. 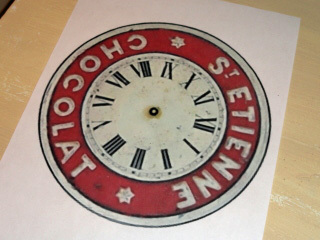 I do have plans to make an actual clock and will probably print the label using photo paper to get a better image quality. I have a few other ideas in mind too but I will save those for another time! What was your favorite recycled craft idea? Do you think you will try any of these? Let me know what you think. Renee,I’m going to make the pencil holder for the fridge. I’m tired of reaching up on top to find the pencil! I also love the clock faces. Thanks for the ideas. LOVE the clock faces! I have an obsession with clocks! I made a couple already and will be posting!! I see a couple of my followers came over after I posted about the clocks!!! Whoo-hoo!!! I will definitely be trying the clock faces on my old CD’s! 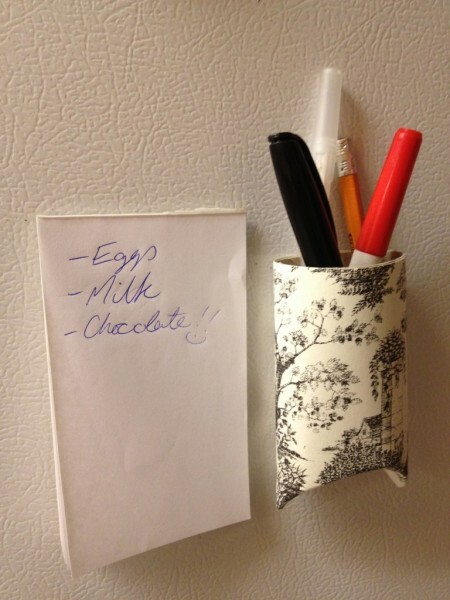 Love this idea and I may wind up saving some money instead of buying them at the antique/flea mart. Great Kathy! I know I was super excited about the cost savings too! I made and sold several of the clock CDs as Christmas ornaments. I used an old package of CD labels that my hubs had. They were hard to line up on the labels but well worth the effort. Those tin cans have me inspired. I’m going to search for vintage flower seed packaet images and do some of them. 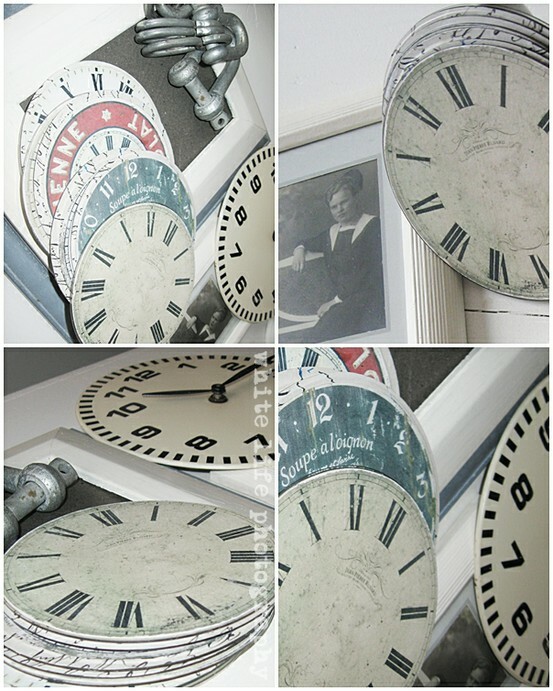 What a great idea to use the clock faces as Christmas ornaments! Good luck with the tin can project, Tee! Awesome idea. This is going on my “to do” list. Yay! I’m glad you like it Betsy. Let me know how it goes. I am trying to find the printable CD clock faces and am not having any luck on the White Life website. Do you have a direct link or can you tell me how to find them? Claudia, Thanks for bringing this to my attention! It appears that White Life has taken the free printable post completely off their website. Check out my update in the post. I found software that you can purchase and download for cd clock faces and I also found one free printable for a plain clock face. I hope this helps you! How do you connect your wine corks? I’ve tried hot glue and they sometimes come apart? Love your repurposing ideas!! Enjoy reusing items that would otherwise be thrown away!! Thanks.